Dose 1 L / 1000 liters of water in the system. Recommended for use in salt water systems and stations denitrification. Check that during the dispersal of Smart Aquarium and minimum after 48 hours, germicidation / sterilization systems with UV to be removed from service. Do not use Smart Aquarium before you are sure that you have a minimum level of 0.1-0.3 mg/l NH4 in water. Do not use Smart Aquarium when NH4 level exceed 1.4 mg/litre. Do not use Smart Aquarium when the pH level is not between 7.0 to 8.5. Do not use Smart Aquarium in the system if the oxygen level is not at minimum at 90% saturation. Do not use Smart Aquarium in the system if you do not have a minimum of 50 mg/l of CaCO3 and a minimum of 30 mg/l MgCO3 or if water hardness is below 3 points (German). 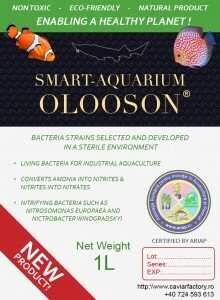 Do not use Smart Aquariumn in the system until you have ensured that the level of vital nutrients identified a minimum level of Cu, Zn, Mo, Fe, P, K.
Do not use Smart Aquarium if you used, or use antibiotics of any kind and in any quantity. For laboratory analysis, you can use our services. Romanian Association for Innovation in Aquaculture and Fisheries (ARIAP) is a non-profit organization founded in 2015 based in Cluj-Napoca, Romania. ARIAP cooperates and supports scientific community with innovative products and solutions.